Caitlyn Jenner likely chose Vanity Fair to reveal her new identity because of the credibility, elegance and permanence of a print magazine -- particularly that magazine. The former Olympic athlete shared her name for the first time publicly on Monday through Vanity Fair's release of its July cover, which bears these three words: "Call me Caitlyn." Jenner is shown in a portrait taken by the famed photographer Annie Leibovitz. There is an accompanying 22-page story by the acclaimed writer Buzz Bissinger. When Vanity Fair released the cover, Jenner immediately shared it from her new Twitter account. After about four hours, the account had one million followers, making her the fastest twitterer to go from zero to a million. She tweeted about it: "Another Jenner world record, and at 65? Who'da thought! Humbled & honored to have reached 1M followers in 4 hrs. Thank you for your support." With new accounts on Twitter, Facebook and Instagram, Jenner is able to speak to fans directly. So why did Jenner chose Vanity Fair for her big reveal? But Samir Husni, the director of Magazine Innovation Center at the University of Mississippi, identified one simple reason: "Vanity Fair is the only magazine that combines celebrity and journalism." "The credibility that a magazine like Vanity Fair carries in the marketplace cannot be matched by the credibility of any other outlet when it comes to investigative journalism and celebrity journalism," Husni said. Indeed, Vanity Fair's cover is one of the most prestigious perches in all of media. And Leibovitz is a legend. The magazine said the photo shoot took place over a two-day period at Jenner's home in Malibu. Mashable reported that "the magazine was concerned about leaks and took security measures 'every step of the way,' including on the photo shoot, in the VF editorial office and at the printing plant for the upcoming issue. The story and pictures were done on a single computer that was never connected to the Internet, with the assets put on a thumb drive every night and then deleted from the computer. The story was even hand-delivered to the printer." A Vanity Fair spokeswoman confirmed the high-security strategy to CNNMoney. And it worked, while rumors began to circulate last week that Jenner would grace the July cover, the pictures and details didn't leak ahead of time. For Vanity Fair, it's a big coup, whether measured by web traffic, press attention or financial opportunity. The print edition will appear on newsstands on June 11 — in New York and Los Angeles — and June 16 nationally. Husni asserted that the only other magazine that Jenner could have chosen was People, but surmised that she went with Vanity Fair due to a "collectibility factor." "That magazine will be retained, will be placed on a coffee table, placed on the shelf. People will pick it up," he said. Husni said he suspected that even the feel of Vanity Fair, which uses thick, glossy paper, played a part in the decision. "For Jenner to choose print, to choose a magazine, it is that tactile feeling," he said. "If it was any pictures on a screen platform, now you see it, now you don't... print has longer lasting impact on you." 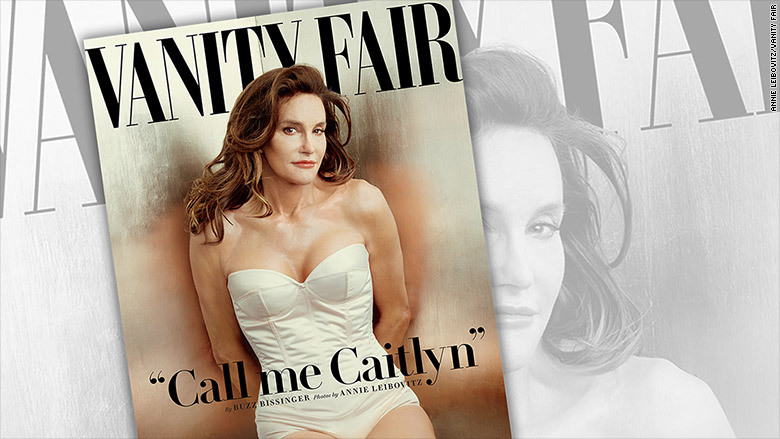 The magazine cover is the next step in Jenner's public transformation. Her first comments about being transgender came in an interview with ABC's Diane Sawyer, which was taped in February and televised in April. Further steps include the acceptance of an ESPYs award in mid-July and the premiere of an E! reality show. The magazine said Bissinger interviewed all three of Jenner's ex-wives -- notably including Kris, who did not speak with Sawyer. "Bissinger spent hundreds of hours with the man the world knew as Bruce Jenner over a period of three months," the magazine said, "and then countless hours with Caitlyn, also attending the photo shoot with Leibovitz." Bissinger also spoke with Jenner's 89-year-old mother, Esther, about Jenner's transition and how she felt after the ABC interview. 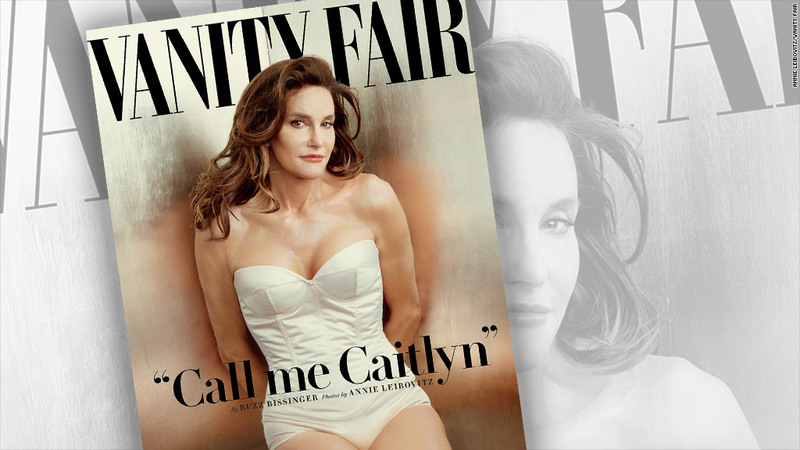 Transgender community advocates applauded Jenner's appearance on the cover. "By sharing her journey with the world, Caitlyn Jenner is accelerating acceptance of transgender people everywhere and reminds us all how important it is to live as your most authentic self," GLAAD CEO Sarah Kate Ellis said in a statement. Right around the same time Vanity Fair released the cover, Jenner tweeted the photo from a new Twitter account with the new name. "I'm so happy after such a long struggle to be living my true self. Welcome to the world Caitlyn. Can't wait for you to get to know her/me," tweeted Jenner. Jenner eclipsed 1 million Twitter followers in just over four hours. She passed the mark in faster time than President Obama who passed 1 million followers in just under five hours on May 18. Jenner also changed her name on her Facebook and Instagram accounts.